May is National Foster Care Month, and it provides opportunities for people nationwide to get involved and show our appreciation for the dedication of the foster families who care for at-risk children and youth, and the social workers who support them. According to the National Foster Care Coalition, on any given day there are more than 400,000 children in foster care. Over the course of a year, nearly 700,000 children spend at least some time in foster care and that makes this population of children and youth bigger than all but 18 U.S. cities. Consider ways you can support the foster families in your congregation. Some churches maintain a clothing closet for those in need. Foster children sometimes come into care with only the clothes on their backs. Some extra clothes, and perhaps a suitcase to carry them would be an incredible gift to many. 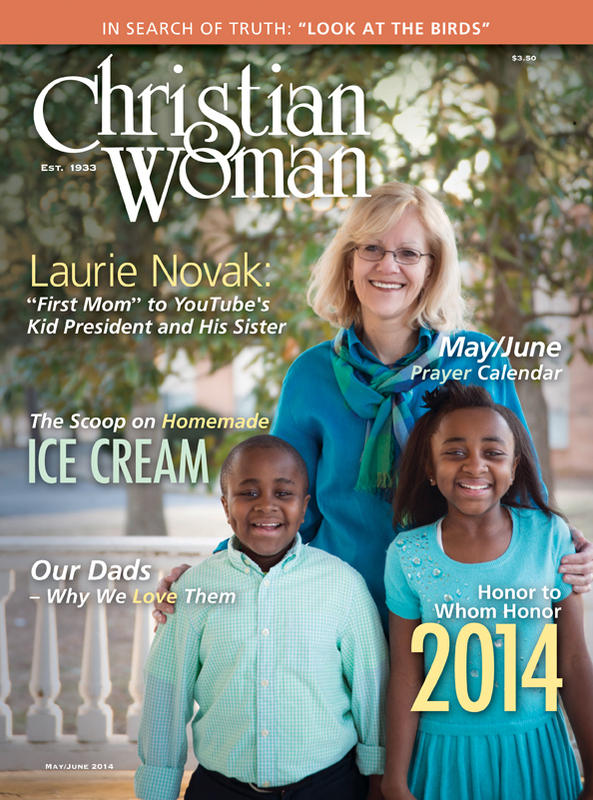 This issue’s cover model is our “Proﬁle,” Laurie Novak, who was first a foster parent to, then became the adoptive mom of YouTube sensation Kid President, also known as Robby Novak, and his sister, Lexi. The siblings suffer from a bone condition called osteogenesis imperfecta, or OI, but they don’t let it slow them down. Take a look inside the latest issue of Christian Woman for their story. To order a copy of the May/June issue, call us at 1-800-251-8446.